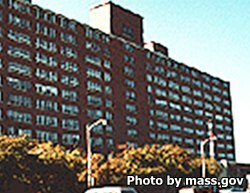 The Lemuel Shattuck Hospital Correctional Unit provides medical treatment and services to inmates throughout the Massachusetts department of correction. Currently, this facility can treat over 100 inmates. This facility has both inpatient and outpatient services. All visitors must schedule at least 24 hours in advance by calling 617-522-7584 ext.133, or by calling 617-971-3384. An inmate can have up to two visitors at a time. Visits are limited to a single hour in duration. SHCU 8 North visiting hours are Mondays-Fridays 6pm-8pm, and Sundays/Saturdays from 1:30pm-2:30pm, and again from 3:30pm-7:30pm.